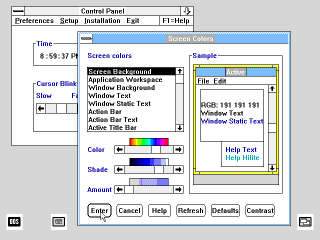 OS/2 1.1 was the very first version to have the Presentation Manager graphical user interface. Version 1.0 started up to a command line interface similar to DOS. 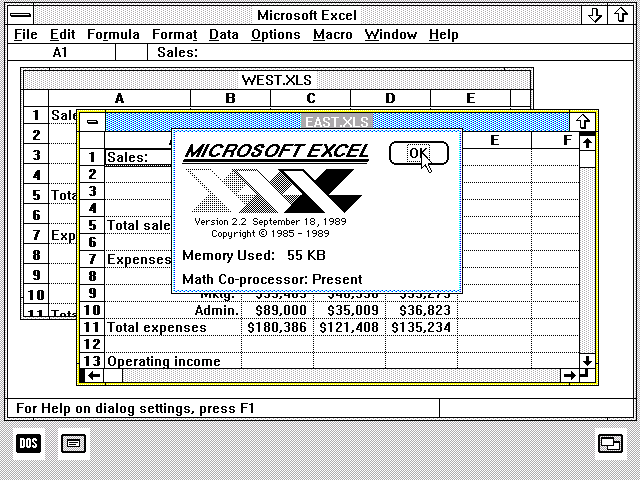 It appears most of the Presentation Manager was developed by Microsoft and ran on top of IBM's operating system. 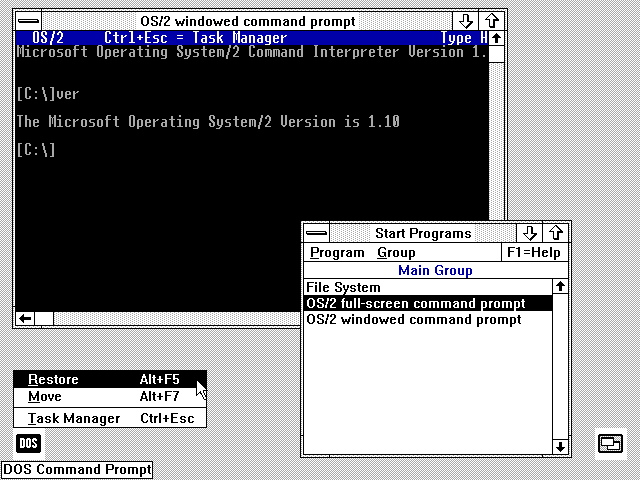 Like MS/PC DOS, OS/2 1.x was branded separately by both Microsoft and IBM. 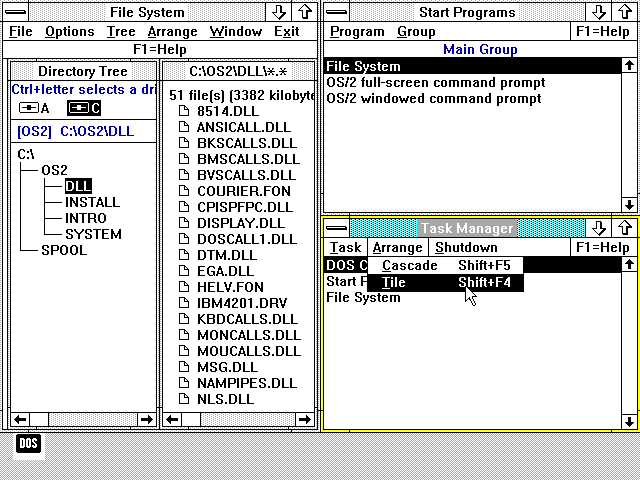 An interesting thing about OS/2 1.1 is that it was released in late 1988, several years before Windows 3.0, yet it has what are essentially early versions of Program Manager, WinFile, and Task Manager. Meanwhile, Windows 2.x was stuck with the MS-DOS Executive. At the time Microsoft was putting its effort in to developing for OS/2, which it believed represented the next generation of operating system. Windows came close to getting the axe, but Microsoft had a fallout with IBM that resulted in them taking their work and moving ahead with the DOS based Windows 3.0 while they worked on their own 32-Bit "NT" OS. 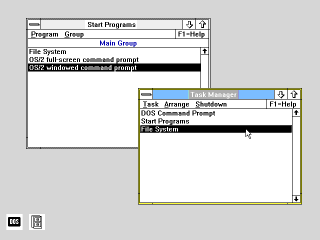 The default OS/2 1.1 desktop contains a "Start Programs" window, a DOS icon in the lower left, and a task manager icon in the lower right. 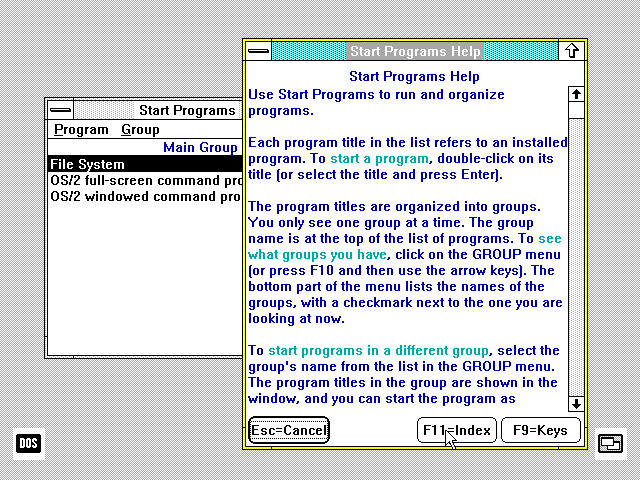 "Start Programs" is functionally similar to the Windows 3.0 Program Manager. 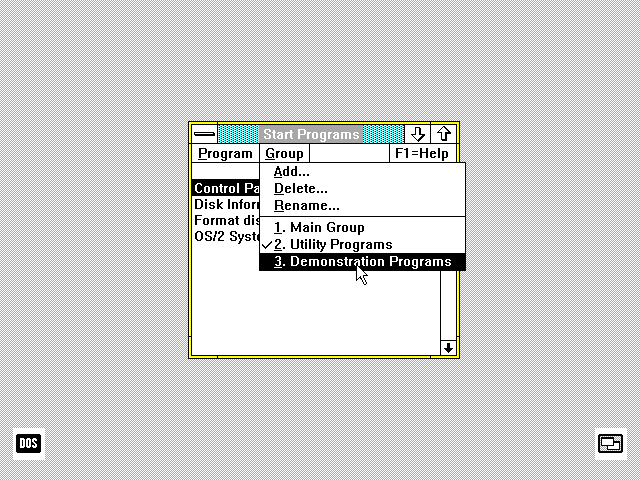 You choose the application you want to start by selecting the appropriate program group from the menu, and then double clicking on the listed program item. 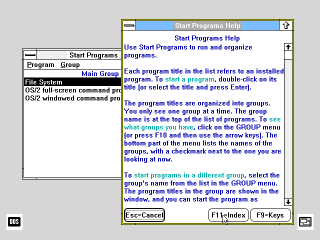 When you install programs, they may automatically add themselves as items and add groups. You may also manually add program items for any executable file on the system. 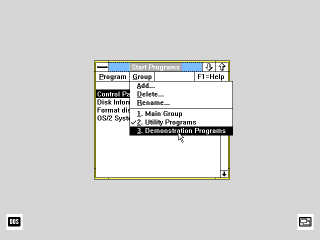 Unlike the Windows 3.0 Program Manager, the "Start Programs" window does not include an icon for each program item, and it does not use child windows for each program group. 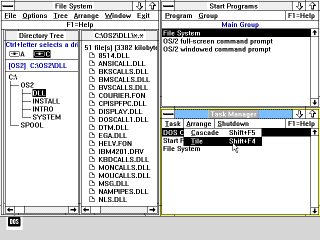 The "File System" program item launches the OS/2 file manager. 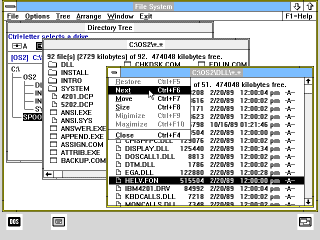 That looks quite a bit like the Windows 3.0 file manager. By default it starts with a tree view of all of the folders on the system. From there you can open folder windows as child windows within the application window. You may view files as a list with icons, or with file details sorted by name, date, or size. A list of available drive icons appears at the top of the directory tree window. You may copy files between folders using drag and drop. Double clicking a file icon will open its associated application, if one is present. Meanwhile, Windows 2.x only had the MS-DOS Executive that could do none of that. The Task Manager is always open, either as a window or as an icon on the desktop. If you double click an item in the task list you bring that window to the foreground. You can also end a task from here - useful if the application's window is not visible. 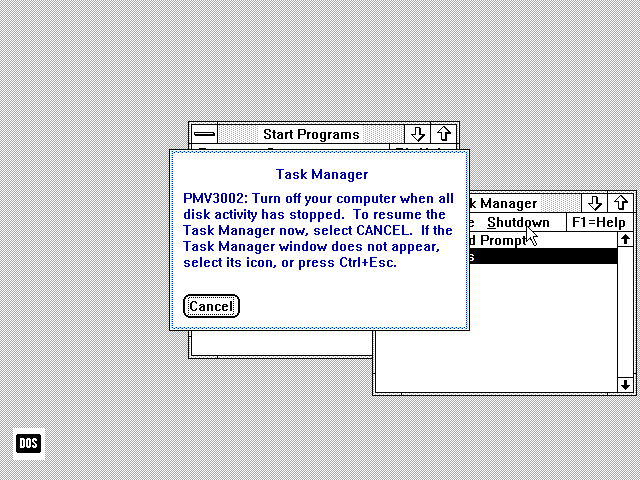 Again, this Task Manager is quite similar to the Windows 3.0 version. 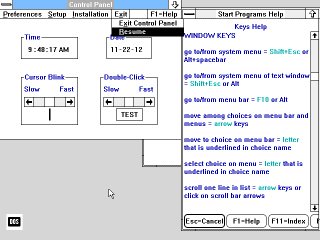 OS/2 1.1 includes a help system. Help files have an index, but despite the presence of colored keywords, the topics do not have hyperlinks. The OS/2 1.1 control panel looks almost exactly like the one from Windows 2. Curiously, the OS/2 1.1 applications seem to try to avoid using the term "OK" in dialogs. Menus are arranged a little differently. There is no "Exit" item under the File menu, but rather an Exit drop down menu. Instead, you select the first menu item under "Exit" to actually exit the application, and the second to resume using the application. This may seem strange, but the intent of "Resume" is that it visibly leaves menu selection mode when you are using the keyboard. Hot keys also work differently. Alt+letter does nothing. Instead you hit ALT to enter menu selection mode and then the letter. 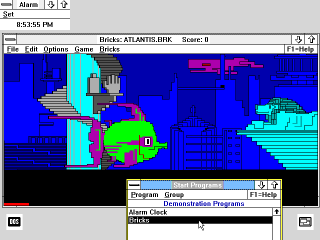 This version of OS/2 only includes two demonstration programs: an alarm, and a Breakout type game. 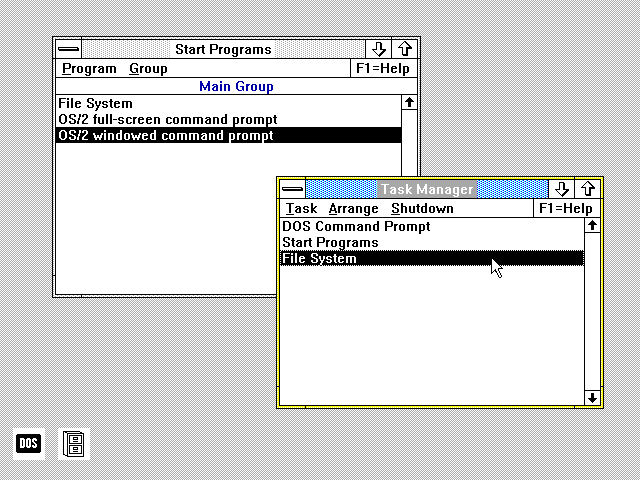 You can run OS/2 command interpreters in a window or full screen. A DOS command prompt is always present and runs full screen when opened. This version of OS/2 can run only one DOS session at a time. From Task Manager you can tile windows similar to Windows 1.x. 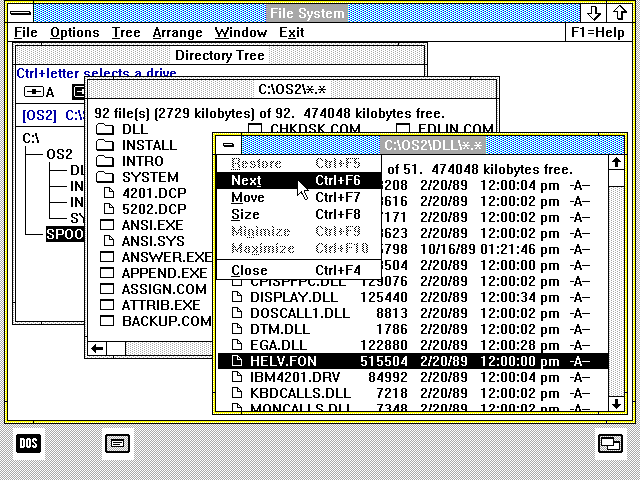 The file manager also enables tiling or cascading its child windows. There is not much more to see in OS/2 1.1. 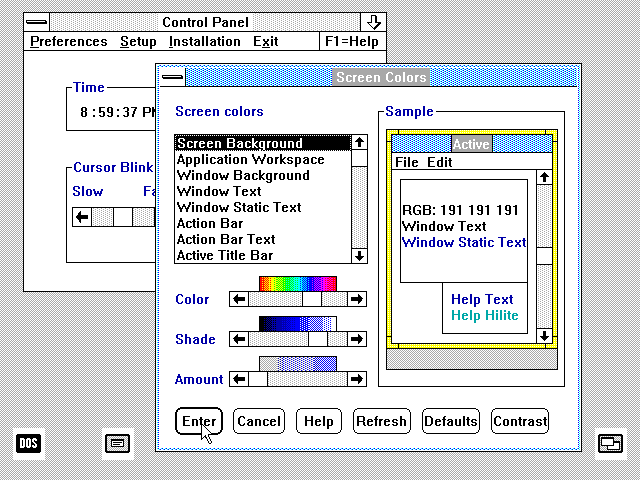 The GUI was rather minimal, and there were not that many GUI applications for this version. 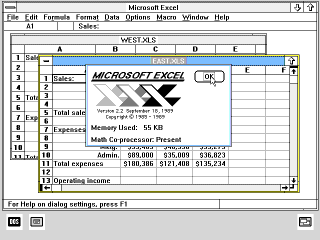 Microsoft did, however, port Excel 2.2 to OS/2 1.1. 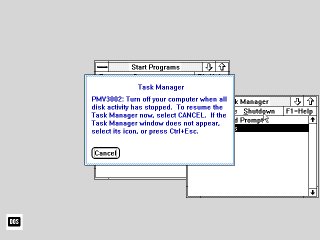 To shut down OS/2 1.1 you open the task manager and select Shutdown->Shutdown Now. It closes any open applications, presumably empties any disk cache, and then then it sits at this dialog. You can chose to cancel and resume using the desktop. In classic IBM style, every message or warning starts with an ID code.